GERAS was the personified spirit (daimon) of old age, one of the malevolent spirits spawned by the goddess Nyx (Night). He was depicted as a tiny, shrivelled-up old man. Geras' opposite number was Hebe, the goddess of youth. "And Nyx (Night) bare hateful Moros (Doom) and black Ker (Violent Death) and Thanatos (Death), and she bare Hypnos (Sleep) and the tribe of Oneiroi (Dreams). And again the goddess murky Nyx, though she lay with none, bare Momos (Blame) and painful Oizys (Misery), and the Hesperides . . . Also she bare the Moirai (Fates) and the ruthless avenging Keres (Death-Fates) . . . Also deadly Nyx bare Nemesis (Envy) to afflict mortal men, and after her, Apate (Deceit) and Philotes (Friendship) and hateful Geras (Old Age) and hard-hearted Eris (Strife)." "Loathsome old age (Geras) pressed full upon him, and he could not move nor lift his limbs." "Harsh old age (Geras) will soon enshroud you--ruthless age which stands someday at the side of every man, deadly, wearying, dreaded even by the gods." "[A comedy in which the Birds have blocked the gods' access to Earth :] Geras (Old Age) also dwells in Olympos. How will they [mankind] get at it? . . . The birds, by Zeus, will add three hundred years to their [men's] life." "The city of Gadeira [Greek colony at Gibralta in Spain] is situated at the extreme end of Europe, and its inhabitants are excessively given to religion; so much so that they have set up an altar to Geras (Old Age), and unlike any other race they sing hymns in honour of Thanatos (Death)." "From Nox (Night) and Erebus [were born] : Fatum (Fate) [Moros], Senectus (Old Age) [i.e. Geras], Mors (Death) [Thanatos], Letum (Dissolution) [Ker], Continentia (Moderation), Somnus (Sleep), Somnia (Dreams), Amor (Love)--that is Lysimeles, Epiphron (Prudence), Porphyrion, Epaphus, Discordia (Discord), Miseria (Misery), Petulantia (Wantonness), Nemesis (Envy), Euphrosyne (Good Cheer), Amicitia (Friendship), Misericordia (Compassion), Styx (Hatred); the three Parcae (Fates), namely Clotho, Lachesis and Atropos; the Hesperides." "Their [Aether and Hemera's] brothers and sisters, whom the ancient genealogists name Amor (Love), Dolus (Guile), Metus (Fear), Labor (Toil), Invidentia (Envy), Fatum (Fate), Senectus (Old-Age) [i.e. Geras], Mors (Death), Tenebrae (Darknesses), Miseria (Misery), Querella (Complaint), Gratia (Favour), Fraus (Fraud), Pertinacia (Obstinacy), the Parcae (Fates), the Hesperides, the Somnia (Dreams) : all of these are fabled to be the children of Erebus (Darkness) and Nox (Night)." "[Aeneas is guided by the Sibyl through the Underworld :] On they went dimly, beneath the lonely night amid the gloom, through the empty halls of Dis [Haides] and his phantom realm . . . Just before the entrance, even within the very jaws of Orcus [Haides], Luctus (Grief) [Penthos] and avenging Curae (Cares) have set their bed; there pale Morbi (Diseases) [Nosoi] dwell, sad Senectus (Old Age) [Geras], and Metus (Fear) [Phobos, and Fames (Hunger) [Limos], temptress to sin, and loathly Egestas (Want) [Aporia], shapes terrible to view; and Letum (Death) [Thanatos] and Labor (Distress) [Ponos]; next, Letum's (Death's) own brother Sopor (Sleep) [Hypnos], and Gaudia (the soul's Guilty Joys), and, on the threshold opposite, the death-dealing Bellum (War) [Polemos], and the Eumenides' [Erinyes', Furies'] iron cells, and maddening Discordia (Strife) [Eris], her snaky locks entwined with bloody ribbons. In the midst an elm, shadowy and vast, spreads her boughs and aged arms, the whome which, men say, false Somnia (Dreams) [Oneiroi] hold, clinging under every leaf." "[At the entrance to the Underworld :] The foul pool of Cocytus' sluggish stream lies here; here the vulture, there the dole-bringing owl utters its cry, and the sad omen of the gruesome screech-owl sounds. The leaves shudder, black with gloomy foliage where sluggish Sopor (Sleep) [Hypnos] clings to the overhanging yew, where sad Fames (Hunger) [Limos] lies with wasted jaws, and Pudor (Shame) [Aidos], too late, hides her guilt-burdened face. Metus (Dread) [Deimos] stalks there, gloomy Pavor (Fear) [Phobos] and gnashing Dolor (Pain) [Algos], sable Luctus (Grief) [Penthos], tottering Morbus (Disease) [Nosos] and iron-girt Bella (War) [Enyo]; and last of all slow Senectus (Old Age) [Geras] supports his steps upon a staff." "[The seer Teiresias (Tiresias) performs necromancy to learn the cause of the pestilence ravaging Thebes :] Suddenly the earth yawned and opened wide with gulf immeasurable. Myself, I saw the numb pools amidst the shadows; myself, the wan gods and night in very truth. My frozen blood stood still and clogged my veins. Forth leaped a savage cohort [of ghosts] . . . Then grim Erinys (Vengeance) shrieked, and blind Furor (Fury) [Lyssa] and Horror (Horror) [Phrike], and all the forms which spawn and lurk midst the eternal shades [i.e. in the underworld]: Luctus (Grief) [Penthos], tearing her hair; Morbus (Disease) [Nosos], scarce holding up her wearied head; Senectus (Age) [Geras], burdened with herself; impending Metus (Fear) [Deimos], and greedy Pestis (Pestilence) [Nosos], the Ogygian people's curse. Our spirits died within us. Even she [Manto daughter of Teiresias] who knew the rites and the arts of her aged sire stood amazed. But he, undaunted and bold from his lost sight, summons the bloodless throng of cruel Dis [Haides]." 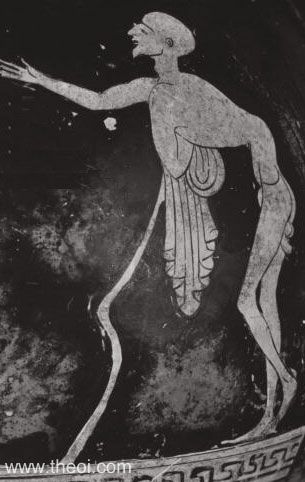 Aristophanes, Birds - Greek Comedy C5th - 4th B.C. 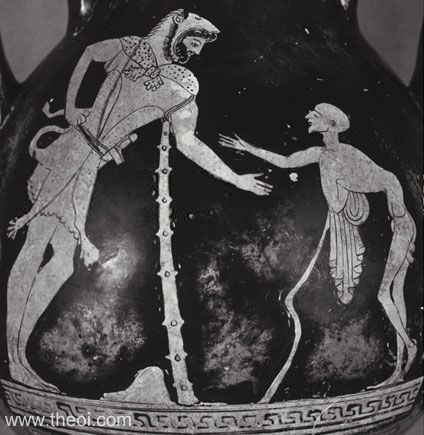 Seneca, Hercules Furens - Latin Tragedy C1st A.D.
Seneca, Oedipus - Latin Tragedy C1st A.D.